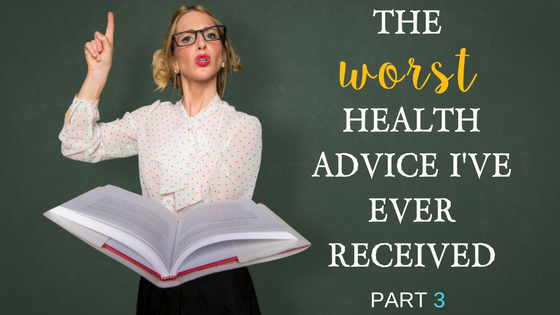 In our final installment of the 3-part series I’m calling, ‘The Worst Health Advice I’ve Ever Received” I’m going to be sharing probably the most ubiquitous bad health advice we’ve BOTH ever received. While the world has advanced with greater and greater scientific and specific health knowledge, it has also made room for a looooooot of bad advice. Today’s bad advice doesn’t have a story around it like the others because to be honest I can’t remember who exactly first told me this one, or if it was actually just my MIND that inferred this advice from simply how society approached health and wellness. HEALTH IS ONLY ABOUT EXERCISE AND NUTRITION. Isn’t this what society teaches us? All you need to focus on in order to get health and stay healthy is to concern your efforts on what you’re eating and how you’re moving. If you struggle with your health, it’s only because you’re not doing something “right” with regards to your movement and your eating. This is what I have believed for over 3 decades of struggle with my body and body image. This advice sent me into a frenzy of exhaustive effort, almost becoming addicted to thinking about my eating, obsessive with my exercise, and never feeling satisfied with where my body was. Oh, you aren’t seeing results? Well, try harder. You adapted to your workouts? Hmm, you should probably just try harder. You put on 5 lbs from a weekend of excessive eating? Try harder! This has been so conditioned to our psyche, we have formed a mindset of lack and scarcity. Never feeling “good enough” and always on guard for the evidence that proves we are underperforming. The thing about believing that advice that all it takes to be health is to focus on your eating and your exercise is because there IS TRUTH in this advice, but it’s only half of the truth. There’s no denying that your physical health depends on your eating and exercise. But it’s missing the 2 other pillars of health— your THINKING (what I call WISE’her) and your SPIRIT (what I called SURREND’her). 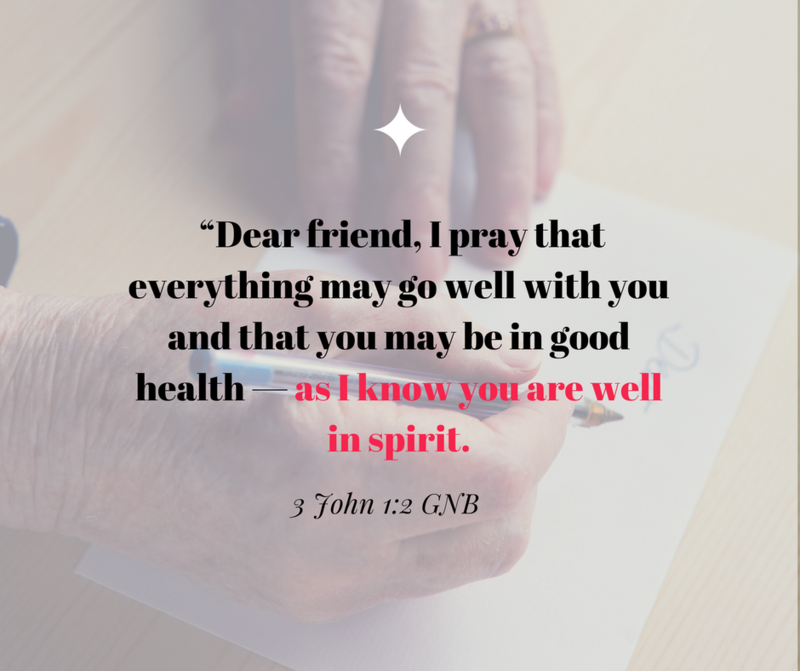 So, let’s get into the WORD of God for what might reveal what TRUE HEALTH looks like for every one of us. John was also the disciple to lived the longest. Where many of the others were martyred for their Faith in Christ the Messiah, John lived into his 80’s in the town of Ephesus. It is from this city that he penned some of the greatest books of the Bible: 1 John, 2 John, 3 John and Revelation. Well, it is in the short letter called 3 John, we see where this wise, Jesus loving, disciple tells us what is KEY to health. John tells us two very critical things in this simple greeting. 1. Our HEALTH is very important to our calling. You cannot be of your best use to God’s mission if you are NOT well in health. While this might seem obvious in statement, it’s NOT obvious when you look at the state of health of the church. I pray that this continues to change in the Body. 2. It tells us that really, our body’s health CAN ONLY BE AS HEALTHY as your spirit and soul. It’s important that you EQUALLY invest in your SOUL (your emotions, your thinking, and your will and motivation) and SPIRIT (your relationship God within you) as you do in your physical health. 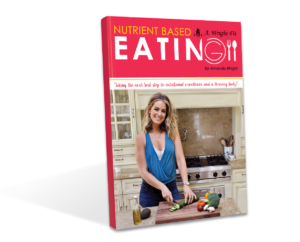 What I realized in order for my struggle-to-turn-to-success in my own body is that my PROBLEMS were not with my body, my eating, and my exercise regimens. My problems were in how I was THINKING about my body, my eating and my exercise. The thoughts that created the feelings and misdirected my motivation all were problems in my SOUL that was buried in my FLESHY nature as opposed to how God has called me to walk, within my SPIRITUAL nature. With this new found freedom of truth I have built a platform of complete education and direction for women who are ready to live TRULY HEALTHY lives. 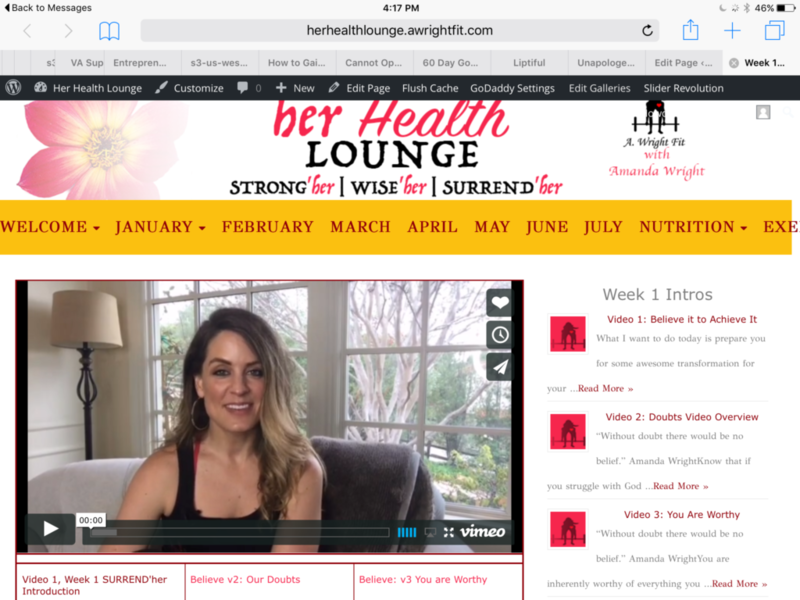 It’s called the her Health Lounge and it’s a 26-week journey to a LIFESTYLE of health. The Lounge is an online portal where all members have 24-hour access to over 80 coaching videos discussing the necessary knowledge one must have to truly walk in Spiritual and Physical health. We spend 8 WEEKS devoted to BODY (nutrition and fitness education), 8 WEEKS devoted to MINDSET, and 8 WEEKS devoted to SPIRIT. 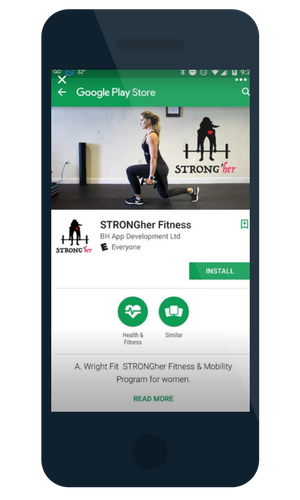 All members receive my best tools for physical success with my Nutrient Based Eating program and book, as well as my signature STRONGher Fitness & Mobility program delivered on the Lounge portal as well as my STRONGher APP with the full-length video demos. The best part is not just the Lounge and it’s amazing content, but it’s the COMMUNITY of women and the COACHING from myself and my co-caoches. This program offers your access the the most encouraging and motivating Facebook group out there! And you will also sign up for either (13) 1:1 coaching calls every 2-weeks or (8) small group coaching calls every 3-weeks. It’s in these calls that you will hold yourself accountable and establish a clear pathway to success! I’d love to welcome you to this opportunity to improve your physical health by focusing equal effort on your Spiritual health as well! The doors open to sign up on April 3 and will close on April 9. Our 26-weeks together will start April 10! Be sure you’re on the waitlist if you want to get first dibs. I’d love to reach out to you to set up a call and chat more to ensure we are a “wright fit” for each other. Click HERE to join that waitlist. 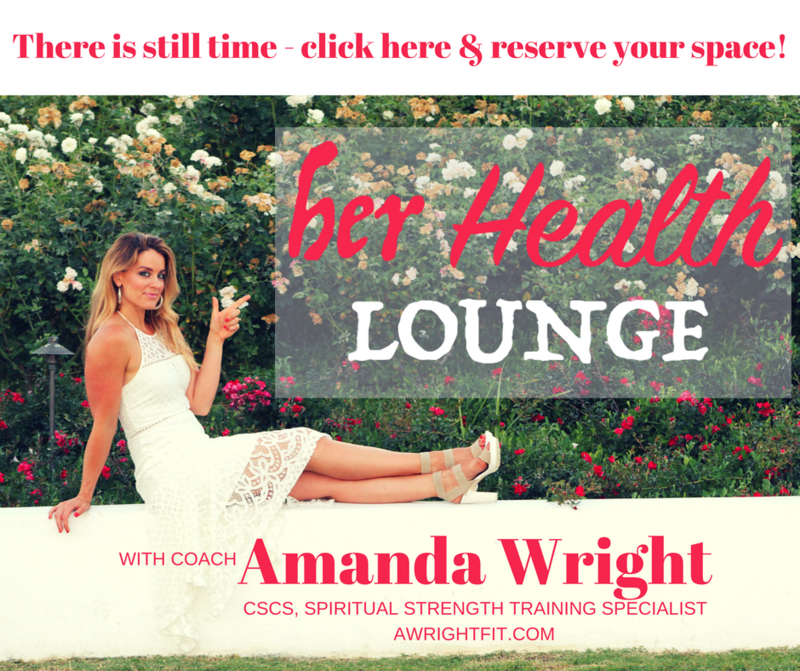 Are you "A. Wright Fit" for the her Health Lounge? Watch and find out!